Students will learn how to observe multiple references and break it up into repeated textures and assets. They will then begin with a basic block out of their scene creating and using modular pieces to fill it up. Throughout this process it will be important to think about breaking up the textures into main textures, secondary, and decals. We will also look at the tools Maya offers for modular workflows. Students will begin importing their initial blockout meshes into Unreal Engine. We will cover basic Unreal 4 tools, grid snapping, and using our modular meshes inside of Unreal 4 to build our scene. Students will also begin to flesh out their visual narrative aspects of the scene. Students will take the plans they made in weeks 1 and 2 to start to break up their models and their respective textures into two lists: ones that they would like to tackle as tileables and the others as uniques. Students will also take note if any large-scale sculpting is needed from ZBrush. Students will learn how to create repeatable textures using a Maya and Photoshop. With emphasis on ensuring repeatability without making it obvious across large surfaces. We will first establish our normal, metalness, and ambient occlusion we will be using for the final textures. Students will learn how to create textures using Quixel Suite for both tiling and unique texture sets. We will add interesting “story” elements to textures (such as wear, decay, scratches, dust, etc. that tell the story of the texture): albedo, roughness, specular, metallic, normal maps. Students will apply their new modular skills and learn the importance of modular modeling and re-use within assets and architecture. This process will also cover applying our tiling textures to the models(UV mapping) while we are finalizing our models and creating simple Unreal 4 shaders for our models in the engine. How to add secondary details to your scene, such as wires/cables,signs, small props, and storytelling: Students will also spend time focusing on development of the visual story elements within the scene. Lastly, we will be creating some additional modular models that can be used as secondary details “on top” of our large modular pieces for variation and asymmetry within our scene. Students will begin adding lights to their Unreal 4 scene and recognizing the importance of colors. We will see how to break up the repetitiveness of the scene with different lighting environments and how shadows can work to our advantage. At this point we can also begin looking at composition for our final renders within the scene. In week 10 we will use everything we have learned to add any additional details, decals, props, vertex painting, and lighting to “finalize the scene.” We will also learn how to take the highest quality screenshots within the Unreal Engine and see how “post process” volumes can add a great deal of interest to our scenes. We will also cover simple post process tweaks of our screenshots inside of photoshop. Students will have between 4 - 5 final images of the scene they have created at this point, as well as a handful of textures/re-usable assets for future scenes. Clinton is currently a principal artist at Midwinter Entertainment. Formerly a senior look development artist at Microsoft Studios: The Coalition located in Vancouver, BC, working on the Gears of War franchise. Clinton is also the founder and owner of Dekogon Studios, an artist collaborative studio. Previously an artist at Bethesda's Battlecry Studios, KIXEYE, Army Game Studio, and various other contract projects with independent studios. Clinton’s primary focuses are environment art, shader development, and art direction. In 2016 he released a textbook with Sam's Publishing with a focus on game art development for Unreal engine. I really like Clinton's style of teaching. Clinton explains any topic very accessible and detailed. I would love to have gone through another course with such a great teacher. Clinton was a great instructor providing excellent feedback great tips and techniques. He also provided extra material relating to each weeks theme or area. This adds more value to course providing tutorials and documents to continue study. Clinton is amazing; I would absolutely take another class with him in a second. Very personable and active in the forums, great with specific feedback examples, clearly knows his technical stuff. He was great. Love that he finds documentations on each subject that we were learning to help us further our education. It was really clear during the readings and it has an incredible patience. Never received late feedback or email. Definitely an incredible teacher and artist! Clinton, you make a very good teacher. How you explain things is a good method and easy to understand. You went above the class material and explained other things too, and answered our questions about the industry. Thanks for such a great class! Vitaly Zhdanov did a breakdown of his recent Soviet Warehouse environment. Hi everyone! My name is Vitaly Zhdanov and I am working as 3D Environment Artist at Anvio VR in Moscow. I graduated from Graphic Design Faculty of International Academy of Business and Management. After the graduation I have been working as a graphic/web-designer for 7 years. But 3 years ago driven by the long-held dream I decided to move over to the game industry and enrolled at the Game Art faculty in Scream School in Moscow. After a year of education, I found my first job in game industry. In order to move forward and keep learning, I entered the CGMA class: UE4 Modular Environments from Clinton Crumpler, where I learned lots of interesting techniques and approaches which I will speak of below. At the first week of the class I had to define the theme of my future scene, which hasn’t had to be massive but at the same time not an easy one for 2 months class. I started with searching the ideas and references in Google and Pinterest and I was lucky to find those nice photos of abandoned soviet bunker\warehouse. In these references I got exactly what I was looking for: relatively small scene, modular elements, interesting lighting and gloomy atmosphere of abandonment. I began to decompose the references and this approach helped me to decide which objects I need and how many of them I need as well as it helped me to plan the modularity. 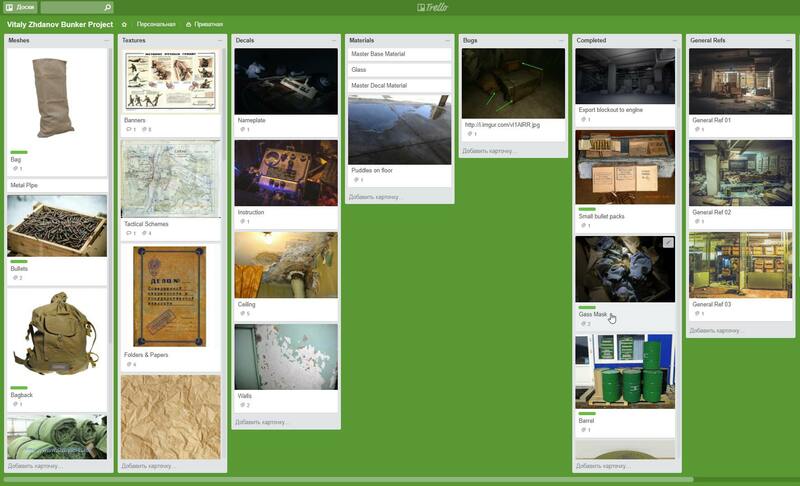 I made my Trello Board to collect different references of objects for the scene, textures, decals and materials, which I wanted to create. With help of Trello I was able to follow the progress and control the amount of work to be done. Checking my references I made the basic blockout of large and medium objects to quickly fill the space of the whole scene. I used Maya for modeling and compiling the draft blockout where I can easily check the connectivity of modular assets between each other. After that I imported these objects into Unreal Engine 4 and made a blockout in engine. At this stage I realized that I can make my scene even more interesting with adding the second floor which required some additional modular elements. During this blockout stage I also positioned the cameras for future beauty shots. At that time I didn’t concentrate my efforts on lighting too much but I still placed several local light sources to better understand the overall look. After I was satisfied with the blockout I began model low polys and high polys of other objects and unwrap UVs. I tried to use trim sheets where it was possible to avoid a great number of unqiue textures. I imported objects and textures into the scene and replaced the block meshes with them. At a certain point I understood that the scene lacks some kind of main object which would draw enough attention. I got back to references in Pinterest and searched out an interesting wall drawing. It was a big luck to find the photo with high enough resolution to make a decal from it. With this drawing my scene started to look more living and sharp. When the major part of the objects were ready I began setting up the light and spent about two days for lighting process. First I added a subtle fog to give some depth and atmosphere. After experimenting with a few variants I realized that the light looks quite simple with any of them. So, once again I returned to my references to inspect them closely with regard to the lights and shadows and this time I detected this purple (violet) hint in the shadow color. That was a good starting point for adjusting the skylight and exponential height fog parameters. I have always tried to check the overall look from different cameras and different camera angles. As written before my main view was determined at the beginning and so I could have made some experiments with light sources to enforce the visual impression. I was just moving the point light behind the door and noticed an interesting shadow of the chain-link on the column. Even though I understood that such effect would be unrealistic, I have still decided to leave it at that because it brings more artistic interest to the composition. After all the lights had been established I moved to post process set up. At the end I opened the screenshot of the scene in Photoshop where I finally tonemapped it for the desired look and imported the LUT texture into post process. The second week was to prepare the work for publication on Artstation. I made several beauty shots and set up camera flythrough for future video. With help of guide by Clinton Crumpler I also made some 360 screenshots. The whole project took me about two and a half months. I have usually worked on it after the working hours on weekdays and full time on the weekends. Apart from lots of new interesting approaches and techniques of modular assets creation that I learned, this class gave me the opportunity to make a full-fledged scene for my portfolio in a limited period of time with deadlines each week. I’d like to thank Clinton Crumpler for his feedbacks, advice and Q&A sessions. For this moment I have also completed two other classes from CGMA, which are Vegetation and Plants for Games by Jeremy Huxley and Texturing and Shading for Games by Kurt Kupser. I really enjoyed these classes also and soon you could see the result of my work on my Artstation profile. I started from a location that requires 4-5 months of work, I think :D And every new iteration gave me a better understanding of not just what I wanted but what I could really do. After a week of work on the location I changed it of course and reduced the size. After all, having your work finished is much more important than making a huge scene you can’t complete. CGMA’s “UE4 Modular Environments” taught by Clinton Crumpler is a 10-week course. In the planning phase of my “Urban Warfare” Environment, I wanted to create a scene that would draw the viewer in and give a feeling of being there. The setting would be an unknown city in Iraq. I really wanted to work a lot with modularity and vertex painting, as I did not have much experience with either one. I felt it was important to make sure the helicopter and vehicles were accounted for in the environment, so the scene wouldn’t feel empty and making sure the crash site would feel plausible and practical. I used the Landscape Spline to create the path of the sidewalk, but I wasn’t able to vertex paint on the sidewalk as it was a Landscape Spline. To solve the problem, I created a blueprint spline that allowed me to vertex paint onto it. One thing I learned during Clinton’s course, is the importance of having a set Time, Place and Story to the environment. To plan the environment and answer questions like: Why did this happen? When did it happen? Where did it happen? Is it sad or happy? This really helped me set the foundation for the overall scene. I made a Trello board to plan what type of props, decals, and textures I would need for the environment. I also made a Pinterest board to gather reference images. After planning and gathering everything I needed, I began to block out of the buildings and environment. Before I put a lot of thought concerning the layout of the city, I began concentrating on the type of helicopter I would use for the crash. First thought was maybe a Black Hawk, but I really wanted a very large helicopter that would be more thought provoking, as to how something so massive could have come down. I came across the CH-47 Chinook on the web and knew that was the one. Next, I began thinking about how the helicopter crashed. A helicopter this size can’t just come down with a shot from a rifle. So I knew it needed to be a missile or rocket of some sort. I was considering an RPG – (Rocket Propelled Grenade), but a helicopter this size would not cruise at an altitude that an RPG could reach. So I went with the idea that the back right engine was struck by a heat guided missile. The reason for thinking out such details, is so I would account for the damage needed while modeling and texturing the helicopter. The story also assists with planning the crash landing portion of the scene. I then consider as to what condition it would be in? I didn’t want the helicopter to be completely disintegrated but yet I didn’t want it to look like it had an easy landing. If the helicopter skid a great distance when it crashed, it would allow me to play a lot more with how it affected the whole street and scene. So that is what I went with. After considering the details of the helicopter, I began planning the layout of the city as to where the helicopter crash would be resting. I decided I wanted the helicopter crash to be resting at an intersection, to give more of a focal point for the environment. After figuring out the information about the helicopter and city layout, I started creating the block out of the buildings in Maya. I knew I didn’t have enough time to make every individual building separate modular sets. So I made sure they would be able to share the same walls, doors, and windows. I also made several window and balcony variations to help hide the modularity feel. With how large I saw this environment was evolving, I became a bit concerned with the timeframe of 10 weeks. So my focus was to model the helicopter as fast as I could, without affecting the quality of the helicopter. As I worked on the helicopter, I also worked on the buildings in the scene. I wanted to make sure that if I was not able to complete the helicopter in time, at least I would have the urban city finished. Using a lot of textures from Textures.com really helped with the tight time frame I had. I also made sure I was taking advantage of Substance Designer as well. When creating the asphalt road debris I used 3ds Max but wasn’t happy with the results I was getting. I knew it would need to be sculpted to get the look I wanted. So I found some basic videos of ZBrush on the web and learned a little bit of ZBrush. I then created the asphalt high poly in ZBrush and decimated it to make the low poly. Then I textured the asphalt pieces in Substance Painter and was much more satisfied with the results. Clinton Crumplers “UE4 Modular Environments” course was such an awesome experience. I began his course with very little knowledge of environment building. Clinton was very patient and helpful with my large scale environment. The weekly feedback from Clinton helped me to learn and enhance skills. It took around 300 hours to complete the environment for the course. Scale and time frame is probably one of the biggest lessons I have learned here. With Clinton’s feedback, lots of work and little sleep. I was able to successfully complete my “Urban Warfare” Environment with the results I hoped for. I had so much fun working on every individual Model, Texture, and Material. An environment this size probably shouldn’t have been attempted in 10 weeks by one individual, but as they say “Go Big or Go Home”! I have become a big fan of CGMA and the classes offered. It’s such an awesome opportunity to be taught by industry professionals who know their stuff. The confidence of knowing that the information and skills I am taught are of AAA standards is flat-out priceless. Peter Nicolai did a breakdown of his colossal library environment, talking about the creation of books, materials, the use of scale and the production of this crazy staircase. Hi, my name is Peter Nicolai. A few months ago, I was a student in Clinton Crumpler’s UE4 Modular Environments class at CGMA. I’ve always loved computer graphics and I’ve worked alongside visual effects and games artists for many years. However, I have always been in the production department dealing with schedules and budgets and people. My art interest has always been practiced at night and on the weekends as a long-term hobby. This class was my first attempt to make something much larger and follow some more specific rules and guidelines as opposed to just tinkering at home. I’m really proud of the work I was able to do during the class and the feedback and critique from everyone has been very encouraging. I have learned a ton from so many other artists who have shared their work or taken the time to make tutorials. I hope something in here will be helpful or useful to others out there. As the class started I had no idea what I was going to build. I was initially thinking of places of a much more modest scale. One of the first assignments was to simply pick your environment, decide what you’re going to build and start gathering reference for it. I was looking for something that would suit my skill set and the fact that this was quite literally the first thing I was going to try to build. I didn’t have, honestly, a ton of confidence going into this so I figured smaller and contained would be smarter. I went to Google and Pinterest and started searching for interior spaces just looking for something that would keep my interest across the class. I wanted a space that offered up enough to work on in terms of both big shapes and small little elements and props. I started looking at random keywords to generate ideas: airplane cabins, castles, libraries, museums, offices, kitchens and any room that seemed both full of details but was also fairly contained. Anyway, in this shotgun search I found some pictures of the Livraria Lello in Porto, Portugal. That staircase popped up and obviously caught my eye. I investigated it a bit more. The more I looked at it the more complex it was; the more intricate details I kept seeing. It actually put me off the idea for several days. I kept looking for other things but the idea just wouldn’t go away. It was just such a cool space and everything else I looked at was not nearly as interesting to me. So I went back to it. I was a little terrified of how much i was attempting (so much for smaller and contained) but decided to start building it anyways just to see how bad it might be. I built a Pinterest board and started collecting as many images I could find. I wanted to try and get a sense of the space and figure out what I actually need to build. To understand the bones of the space I wound up doing a handful of construction pencil sketches on the side to try to establish the layout in my mind and to understand how things were arranged in space in relation to each other. Once the ref was assembled there was nothing to do but build a quick block out version of the space to help me decide if I could actually use this location. The goal was to simply match the reality of what I saw as best I could. I wasn’t trying to put any “post apocalyptic” spin on the space. Armed with the reference and Pinterest board I started looking at both the interior and exterior photos again to try to establish some kind of size and scale. At one point, I was online trying to find if there were any public records that would even describe the size of the lot or dimensions of the building. In the end I never found a single measurement that I could rely on. I had to eyeball everything and make some educated guesses about expected standards for retail counter tops and doors. I used the heights of human beings and other “known” objects to establish some metrics. Once I had those measurements in hand it all boiled down to just building a bunch of boxes in Maya and seeing how it felt. I’d review these again and again against how it looked with any of the human ref were standing next to these objects. Did the hallways look wide enough? Were the railings tall enough? There was a lot of back and forth here. If a basic assumption changed (one that had informed the other assumptions), it was a lot of work to tweak, a house of cards of guesswork. In the end, one of the most valuable things that I found buried amongst my ref was from a site that had gone to the bookstore and actually captured a bunch of 360 photos from six or seven locations. That bit of reference was a godsend. It really helped put a lot of the other ref in context. I had a lot of vacation photos, wildly varying lighting conditions, pics that were nearly but not quite framed on the detail I wanted to see etc. The project would’ve been a lot harder if I hadn’t been able to find these additional reference pictures. It was also during this block out phase that I started to understand how I would actually build this place in a modular fashion. When I had first seen the photos I responded to the cool shapes and architectural detail scattered throughout. It wasn’t until I really *looked* at it with more patient eyes that I could start to peel back some of the visually dense layers and start seeing the kind repeating building blocks just underneath. Once I started seeing that, I was surprised at how modular the space already was. It was actually an excellent experiment to try and build a large space using a smaller number of repeatable parts. In Maya, First (l) and Second (r) Floor WIP blockout. It was all very low rez (primitive boxes) and so there was no nothing precious about it. I would rip things out, break them up, recombine them. This block out phase directly informed the breakdown between modular, hero and crazy ornate detail pieces I would need to build. During this phase, I was also implicitly trying to do some visual editing. There was just so much detail with lots of little carvings and specific patterns all over the place. I would try to keep the visual density or business but I wanted to reuse as much as possible and build as little as possible. As the modeling was in progress, I would start moving pieces between these three tiers. It would also help me define the kind of blueprints that I wanted to build in engine. To make set up that much simpler, I would start assembling these pieces into blueprints that would make the level layout that much more straightforward. For example, the upstairs and downstairs bookshelves were combinations of anywhere from 3 to 7 other little meshes. In UE, The original bookshelf mesh, the additional pieces and the two BPs placed in the level. The halogen lighting downstairs is another blueprint. It contains the cable, the light housing, and the light itself. On that one I exposed a couple parameters to allow free rotation of each light along with color, intensity, fall off and a matching bounce light. It is pretty basic stuff but it was still was wildly effective when it came to those subtle little things that let your eye relax to the point where it doesn’t see the repeating pattern and takes in the whole picture. In UE, The halogen lighting rig. Each BP runs the length of four halogen lights. In UE, a quick drop in test for the base wood material. I was doing my texturing largely in Substance Painter. Photoshop was used every once in a while just to get some quick fixes finished. Most texturing was based off of the stock materials that Allegorithmic delivers. I modified them enough to suit my needs in terms of colors, scale, or how visible the wooden ring patterns were. I was putting together my own saved custom materials against a bunch of the materials that I saw in the photos. Once I got one that was looking good I quite frankly duplicated it and made a quick color tint so that it would look different enough that the difference would read and then saved it out. I wanted to get those base materials in there and playing against the lighting and as quickly as possible to see how the whole thing was sitting together. As I mentioned I have worked around other computer graphics artists for a long time now and one of things that I’m used to doing in art reviews is the ability to A/B new versions of an asset. I tried to bring a very little bit of that process to this environment build. I set myself up with a bunch of saved camera positions that showed off the space and also covered the lighting conditions and different materials. It gave me a place to go back to to understand my current changes and whether I liked the direction they were going. The modeling workflow is pretty straightforward. I don’t have any grand insights to offer anyone here. I’m not a good enough modeler to have reinvented the wheel or come up with any new tips or tricks. My modeling process is fairly basic with a heavy dose of trial and error on some of the more flowy shapes (i.e. the central staircase). Basically I would take the lo-res shapes from the block out and treat that like the bounding box. I knew that I could model whatever I needed as long as it fit inside that shape. If there were specific connection points to maintain I made note of those as well. Most everything was done in Maya. Occasionally I would jump over to Modo for a few pieces as little experiments. The goal was to get a rough pass of everything in pretty quick. My plan was to drop in early temp lighting as soon as possible. I wanted something that would be representative of the cubbyholes and negative spaces to get a read on how the whole thing was looking. Because of the size of the space it helped keep me from getting too wrapped up in details too early on in any one piece. (I wasn’t always successful here but some things are just fun to model and the time just slips away.) I swept through front to back and top to bottom looking at the whole thing and trying to get a sense of where there were bare spots. I was constantly discovering pieces that had no block out shape or could be recombined or split up differently. It was a very cyclical and organic process. Sometimes it felt like it would never end but it was just a lot of pretty fundamental basics to get all the shapes together. The one thing that did continue to evolve as I was modeling was another key aspect of the class. The goal was to was to get you to understand what was a hero piece, what was a modular piece and what details or shapes could be captured in trim sheets. I was building trim sheets in parallel to see the detail that the technique captures. It was really interesting to see the levels of high-frequency visual detail and decorative carvings show up really well when I got it in engine. I was pretty excited by the results. This was my first exposure to proper trim sheets. I did not understand just how far you could push them. The class and the information Clinton shared was a real eye opener for me. I started allocating space in a sheet for various patterns I wanted to capture. They were all modeled in Maya. The bakes happened in substance. In the end I cut the sheet in half which is what made it into the engine. The removed elements were promoted to their own assets with a different texturing solution. I’m sure I didn’t take enough advantage of the technique in this build; they were still so new to me. I’ll need to go back with fresh eyes to see where else I can put them to best use. Photoshop planning for trim sheet and the WIP tiling geo in Maya. In UE, flat plane testing with trim sheet texture applied. The books are a huge influence on the sense of the space. It was a shift in the blockout phase to get those things in there even as simple white boxes; they take up a lot of screen space. There’s actually just one book. It’s a very basic model with two materials on it. One for the “cover” the other for the “pages”. It may sound weird but I actually didn’t want to call specific attention to them. They are everywhere but they aren’t the point, if that makes sense. I don’t want a viewer to notice “a” book but rather “books”; they should just think “that’s a ton of books” then their eye should let go of it and take in the store as a whole. In UE, Single book. Then three BP groups of books. I only ever modeled the one and then set up a number of blueprints with books of varying configurations. I made a variety of stacks of books and then a couple leaning to left and right. Each book in a group had some built in scale, position and rotational offset to make them look a bit more “messy” and realistic. (“You’re right. No human being would stack books like this.”) These small arrangements were used to build up the bookcase patterns. The bookcase patterns themselves were then repeated throughout. I was trying to reuse as much as possible. As long as my eyes couldn’t “feel” the stamped repeating pattern then it was fine. For all the colors, I built a basic material with two color ramps based on the world space position of the individual book. Each ramp was multiplied together to get a color and variation for each book. Some additional params were set up for saturation and brightness. As you move whole stack, front to back of the store and then up and down the shelves, they would all change their color and value. All that visual detail and color variation is for “free”. The staircase is definitely impressive as you look at the photos and it’s the centerpiece of the building in my opinion. When I was first looking at whether I would even do this space, a lot of it hinged on whether I thought I could actually build that staircase. It was the first thing I tried blocking out. In the end I think I blocked it in and rebuilt it possibly four or five times just to try to understand the form, then how I would break it down based on construction methodology, reusability, UVs etc. I started with some basic circles and top down views to establish some nice elegant curves. The side elevations were a bit more constrained in that I had my overall building proportions and a set number of stairs with which to work. I experimented a lot with how to build the pieces and where to break them. My first version of it was just a box that I modeled out and then threw some quick subdivision and smoothing on. It looks like a ramp out of a sci-fi movie but it gave me a placeholder. It also gave me some poly curves that I could then extract and extrude along or loft and that’s what started me on the process towards building up the pieces. I extruded profiles along that curve. Slowly I’ve got railings, now I’ve got that decorative wrap and so on. I just went through a series of experiments again and again. These experiments would change as the pieces and their cut points changed. Later I would build different pieces “straight” then bend them to match the curves. It was the a mix of both construction and grouping tests. It was very challenging for me. A rough dev timeline for the staircase from L to R.
On the left, a few of the measuring tools (stair heights, important join/split points along the stairs, radius reminders) and shape guides I used to figure out how this would all fit together. On the R, a temp section of modular railing. One of the testing scenes. A mix of curve, bend and wire tests to see how to achieve the shapes for the railings, banisters etc. I wound up taking what had been the full staircase and carving it up into three main sections (the top stairs coming down to that “V” landing, the circular pattern in the middle, and then last row of stairs hitting the ground floor). Each of those sections is made up of multiple pieces of the stairs themselves: railings, posts, trim detail, stairs, decorative baseboards. In UE, Individual pieces exploded (l) and assembled (r). Photobashed ref of the real stairs (you can see my note on certain stairs where I started to consider splitting things). In UE, WIP red stair textures trying to match the wear and scuffing. The stained-glass ceiling is a total cheat. It is just one big flat card with a texture. All the ceiling and molding around it is geometry that I’ve built. I found photos of the stained-glass window so I grabbed the best one I could get and went into Photoshop. I did some editing there to build what I needed and then just dealt with it all in the shader. I turned it into a translucent material so that all my exterior lighting would shine through that space. It was another big element to get looking right. The stained-glass and the central staircase really serve as the central focal point for this space. In UE, early stained glass lighting test. In UE, early lighting test. The first tests when I saw some actual colored light coming through that thing were pretty exciting to see. It was a straightforward set up I grabbed out of the UE4 documentation for putting the shader together. The rest of it was iteration on the lighting and integrating it with the rest of the environment. I knew i wanted the stained glass window itself to be bright and back lit; I knew I needed it to flood the surrounding vertical ceiling pieces with light and then have a nice falloff across the horizontal ceiling as you moved into shadow. That all boiled down to repeated bakes and massaging of numbers till it looked “right”. I knew for me that the lighting was going to be a challenge. I had the glass windows on one side of the building, the big skylight up above with the stained-glass window, all the localized halogens downstairs, the bookcase lights upstairs etc. It was a lot for me to balance with all the various subtleties from these sources. Once I had the block in meshes together I started running several lighting “wedges” for my own edification. Since I’d not tried building a space like this before I wanted to make sure that I understood what to expect visually when I was operating at different lighting quality bakes. I wanted to understand when I saw a certain kind of artifact or result that I was familiar with what would go away at a higher quality bake versus what might be an actual bug or issues to track down. It felt like a good use of time to take a couple days up front and run these tests. A ref comp of my lighting test frames. the “direct” and “indirect” were my named light sets. I ran individual wedges of each of those lighting passes at several different bake qualities. This let me get familiar with what shows up from what light “set” at each level. I also got in the habit of screen capturing all 10 saved camera positions in a variety of view settings (lighting, detail lighting, lit) after most bakes. This gave me a pretty good living record of what was happening and helped get my eye used to “reading” the scene. My goal was to use these images as touch points so that every time I improve a model, changed lighting, updated a texture I would have something to A/B against. Is my change better or worse? Did I fix something upstairs only to break something downstairs? When the heck did that lamp turn purple? It served as a way for me to sanity check myself while working. As I would do better and better bakes later in the process it was always nice to have that growing ref to go back to. You could really picked out the evolution of any one particular camera position and understand what elements were working or what you may have lost and wanted to bring back. As the bakes progressed I also cheated in bounce and fill lights as necessary. It became easier to add additional lights and tweak their color and intensity to achieve the effect I wanted as opposed to continually poking at lightmass settings. I was very happy with the match I got upstairs. When I saw this comparison, I felt pretty relieved that I was on the right track. This happened on my way to trying to finalize the lighting. The color variations were forgivable and a lot easier to tweak and tune later. But I was pretty happy with the overall feel of the light from screen R. There is still plenty to tweak and adjust (other lights to activate screen L) but this moment was a big confidence booster. I still couldn’t tell you if I built it all “well” or as efficiently or as intelligently as possible but that will come with time and experience I suppose. The idea of a one stop shop lighting scenario that works for the whole space is still something that is elusive to me. I don’t think I was able to successfully balance the darkest parts of the first floor to get them to work with the brightest parts of the second. The lower floor still looks wrong to me, muddy and ‘off’ somehow. Perhaps I’ll make a second lighting scenario and let one “sell” the top floor while the other supports the lower floor. Post-processing we kept to a minimum till the very end. I worked with the eye adaptation turned off and locked in at a neutral exposure. Overall, the class ran for 10 weeks. If you carve off the first week as the reference gathering and deciding what you’re going to build and carve off the last week for making last-minute lighting tweaks and final bakes you have about eight solid weeks for production (blockout, model, UV, texture, light, post process, cameras etc). It is a fair bit of time if used wisely but it can sneak by you in a heartbeat if you aren’t careful. Figuring out some sort of schedule, milestones or pacing markers for yourself is critical (and that is not *just* the producer in me speaking). You have to do what you can to make sure it is something you are engaged and interested in. You may not be able to do that everyday at work but this is your project so do something that really inspires you because there is a lot of (really fun) work ahead. For all the times when I was slowed or stuck trying to figure out some problem, I was happy to be doing it since I happened to pick this fun place to build. What I took away from the class wasn’t about specific modeling and texturing techniques, though those are covered in the forums and in the feedback sessions if you need them. The critical takeaway for me was more about ways to think about how to treat different elements in the scene: the categorization of hero, modular, trim etc. That was something that I didn’t have in my mental toolkit beforehand. The ability to be in the middle of building an object, change my mind as to its importance or on how I’m going to build it, and have a roadmap in mind of how to execute that new plan is a big confidence booster for me. It definitely helps me understand how the more seasoned professionals can look at concept art or ref and come up with a plan of attack on on how to build things efficiently in putting these beautiful scenes together. As for quality, I just wanted everything to look consistent. I can think of a few things that may have helped me keep the quality bar consistent while working relatively quickly and across all the assets. I think the tools that I used helped dramatically. As I mentioned my modeling was pretty straightforward in Maya and I used Substance for 99% of the textures. Changes made later could be quickly pushed to assets or texture sheets when I was ready for that. I also think the consistent review cameras helped me keep my head above water when all the pieces were in flight. Overall, the enviro still needs work to bring it to truly “final” but the class was finished. I’d bitten off a bit too much to get done in the alloted time but I’m happy with how far I was able to push it. The remaining polish will happen on my own time. Overall, the class was a great experience and a ton of fun. Hello, good people of 80 level. I am Vladimir Lepotic, a 3D Artist from Serbia. The path that led me to my current position of 3D artist was a mixture of different interests and searching for the right one, which, I believe, I found. That mix was also beneficial to me because I learned different skills from different areas and trained my eye to understand things from various points of view. I studied architecture at the University of Belgrade. After college, I worked as a graphic designer for Fnatic, one of the biggest names in competitive gaming. At that time I also knew a couple of things about 3D so I got the opportunity to work on my first 3D model for the game. I worked with my friend and colleague on the “hero set” for the Dota 2 which was imported into a game. Afterward, I was totally into 3D and gaming industry in general and started to pave my path in that direction. Since then I worked as a 3D artist for a couple of other independent studios and contract projects and recently started to work at Art Bully studio here in Belgrade. The main idea was to apply the concept “less is more” to the project. My starting point was to think about the kind of emotion I would like to get. I also wanted to test myself and my current knowledge of UE4. This scene wasn’t so demanding from the modeling point of view, therefore it was a perfect choice for the task. The inspiration for all of that came when I was looking for some architecture projects and stumbled upon a project by Quang Le and Lien Hoang Phuong. It was a very clear and strong concept and their project was a winner of INNATUR 3 propose fresh ideas of blending architecture and nature. I realized that I wanted to make a similar thing in UE4 and bring that scene to life with some extra touch and few ideas of my own, of course, to make it look more abandoned or maybe even post-apocalyptic. The idea behind this project was to make the scene that is simple from a modeling point of view but also readable and a good base to make most out of the lighting. The first stage was to make the modular cubes (walls) and to block out the scene. I pretty much used only one mesh cube for the blockout phase so that part wasn’t so time-consuming. At that stage, I used textures that were still WIP just to have some rough impresion of how things work together. After that, I added a couple of decals in the building for the labels. I also placed directional lights to have some starting point and something to work with. Texturing for this scene was pretty simple since it’s mostly about concrete. So it was about making good tileable textures of concrete. I used images from the internet and Substance Painter for extra touches. After that, I made 2 or 3 variations so I can use it for vertex painting in UE4. Also, the texturing is one of the most important aspects of any scene because small tweaks define a realistic look. I always pay attention here and tilt the sliders until I am satisfied with the results. The key thing when working with minimalistic scenes is to make the most of what you have. Generally, you are overexposed when you are working with minimalistic stuff (that is also noticeable in graphic design, for example) and you just can’t hide things. In an overcrowded scene, you can hide some stuff that doesn’t really work, because the eyes are overwhelmed by all the information. When you work with minimalistic scenes it is even more important that things just work together as they should. The important part for any scene, for minimalistic especially, is lightning. It can elevate the scene up to the next level or totally ruin it. Therefore, I would suggest paying extra attention to it, because if there are no interesting assets, lightning turns out to be of the highest importance. It sets the atmosphere of the whole scenario and brings it to life. Next part I was working on was the foliage. For the lianas, I used one texture atlas from the Megascans library. For the foliage placement, I used UE4 tool and tweaked some details. Another important part of making a good-looking foliage was to set up materials properly, and by that I mean to add parameters for the color variation, subsampling, and wind movement. It is all about subtle touches but it makes the final model look more realistic. One trick that helps make foliage look better and more realistic is to pump a bit the intensity of a normal map. To do that, we have to make a 3vector with AppendVector and use the intensity control for only Red and Green channels and set the Blue one to 1. There is no big secret here, just tweaking and testing until the results look good. I have to add that even if I always tend to stay with the “game-ready” scene as much as possible, for this particular one it would still need work and optimisation to really be one and to drop FPS to more enjoyable levels for a player. Hence, I went for the more cinematic approach with this scene. For the scene lighting, I used dynamic lights to speed up the process (movable lights in UE4) so there wasn’t any light-bake involved. I decided to choose one directional light. Beside directional light, I also used sky light, reflection capture spheres, and exponential height fog. Also, I turned on “generate mesh distance fields” in UE4 “project settings” to boost up the shadows. It really helps to ground everything together and to boost the scene and make it more believable. It is necessary to restart the project before the effect appears. Since the whole project was kind of a playground to test different things, I tried “Light propagation volumes” or LPV. To enable the feature, the command “r.LightPropagationVolume = 1” has to be put in “ConsoleVariables.ini” file because it can’t be changed at runtime. The file is located in Program Files\Epic Games\UE_”version”\Engine\Config and again the engine has to be restarted to see the effect. It is a bit tricky to get good results with it and I didn’t feel like I have much of a control over it, which is understandable since LPV is an experimental feature in UE4. From my experience, it is more of random tries and errors until you get something that looks good. Nevertheless, it can give you that additional boost for the lighting and occlusion of the scene. I would say it is more like a cherry on top of the cake and it can easily go without it. Here is a more in-depth explanation of LPV in UE4 documentation. Also, there are some things that I really wanted to be visible but it just couldn’t be achieved with only one directional light. By that, I mean visible rays that come through windows and bounce a little bit on the surface border of the hole. That was the main challenge and finally, I decided to fake that effect with spot and point lights placed outside of the windows to boost the lighting coming through them. I also paid attention to how to properly place the directional light to make the most of it and to get as many interesting shadows as I could. I also used particle systems for the dust and falling leaves. It is barely noticeable, but it gives the scene a bit of dynamism, since without it, the whole scenery would be completely static. There are many good tutorials on YouTube that give a great explanation on how to make simple particle systems as these, so you can check that out if you want. One more important thing that I want to mention is the post-process. I use it as a final touch to make the image even more believable and to play with colors a bit more. It is pretty much the same process as the adjustments that are done on the images in Photoshop, for example. I placed one post-process volume box in the scene, set to unbound and adjusted parameters until I was satisfied with the final result. It all goes down to good using of color correction and “eye-balling” until the scene looks more pleasing. As you can see in the previous image I used Look Up Tables (LUT) to achieve the desired colors because I find it to be the easiest way to achieve good results, at least for me. It is as simple as taking a screenshot of the scene and color correcting it in some program that you are most familiar with, then using the same adjustments for the LUT image and after that going back with that LUT and placing it in UE4 post-process volume. I would also mention the sound as another important component. It is well known that visual and sound parts are always a good combination and goes hand in hand together so I always tend to find good music that will suit my scene and also enhance the emotion and feeling that I try to present. Melody in the background for this particular scene is “Among Trees” made by – Krale. It is a beautiful music and it blended very well with the scene. A hard thing for me was to understand when to stop because I can always find something that can be better even now when I look at this project. So I would suggest thinking that it is really okay not to be 100% satisfied with the result and to place the bar a little lower. In that case, if you work on something, you won’t end up in some never ending loop and going through a despair of not finishing anything completely. At the end, I would also like to add that I learned a lot of new things about the environment art during a course at CGMA Academy where I was mentored by Clinton Crumpler. He is a really talented artist and a great guy in general and I would like to take this opportunity and thank him for his awesome teaching. I need to mention that I also learned a lot of new things from the internet, from guys like Koola and 51Daedalus (he has great UE4 lighting tutorials on Youtube) and I would like to thank them too for sharing their knowledge about UE4 and being an inspiration for me to learn more. For more of my work, visit my portfolio on Artstation or my Facebook page to see what I am working on. This project can also be found on my Youtube channel. 3d Artist Daniel Cangini discusses the way we’re working with the production of beautiful environments. Hello everyone! My name is Daniel Cangini and I am an environmental artist who currently works as a graphic designer in Rome, Italy. In 2012, I obtained a Bachelor’s Degree in the University of Rome “La Sapienza” in the Graphic and Multimedia Project focused on “3D Digital Art & Design”. After graduating in 2012 I worked in Direct2Brain as Modeling Artist, it was an incredible experience where I met and worked with so many talented and dedicated artists. During July 2012, I went to Montreal, where I attended a class of meetings on “3D environments and resources for video games” for the creation of gaming environments with UDK3. Following my passion for building real-time environments for Games and pushing myself to pursue my career as an environmental artist, I decided to subscribe to Clinton Crumpler’s CGMA environment class, where he provided me with a solid program focused on the process to build an environment from start to finish. My main goal was to learn the process of creating environments in Unreal. I had established a quick Trello board to organize my thoughts and I began examining ruins images to understand how they were built and where I can break the modular repetition. I started by gathering multiple references to have a solid compositional ideas, find things that make the location unique and how to breaking up the textures into main textures, secondary, and decals. After analyze the Images collected, I started to work on a style guide. I focused on the main design, what assets would be built inspired on the Uncharted Temples environments. When I started the scene blockout, I concentrated on the proportions and scale of the asset, this was the best way to test the composition and scale of assets in 3D space and make quick changes before creating the final pieces. Once I created the shapes for the modular pieces and large props that I liked, I then continued to block out the assets on details. Then I exported each piece individually and assembled my meshes in UE4. The Temple was a compositional element integration with strong emphasis placed on harmony between architecture and striking natural surroundings. I kept the main meshes simple and flexible by using the modular modeling and tiling textures for re-usable assets. I used painter and designer to develop my materials. With Substance Designer I began by creating the Height map. My workflow for the texturing involved finding a lot of images and reference to work from, design the main shapes or patterns, develop the color variations. Once I was satisfied with my base material I would move towards building the damage by adding secondary details before finishing the textures. A first challenge was to create the shader in Unreal. Because I wanted this material to be scalable and have the same texel density. I began setting up a master material for props with appropriately shader system. From a Master Material I create the Instances Material. I like to use and play with The Material Instances because they are useful to make changes in real time. Keeping in mind the amount of vegetation to be included, I started hand modeling with planes in 3ds max and positioning them until I had the main shapes desired. For the texture process, I used CG Textures, and Substance B2M to get the Normal Roughness and A.O info from my Albedo textures. Next, I exported the channel packing textures into Unreal. To simulate the subsurface scattering, I created a master foliage shader with two sided foliage. Then I implemented the (Subsurface amount parameter) and plugged it into my master material. I used this same method for all of my plants, trees and canopies. I started creating the terrain master material to use the vertex paint, modulate that blending and add features such as parallax and wetness. With the use of the Vertex painting I decided areas where the mud, grass and leaves would appear or add and remove the puddles. I used vertex paint in combination with additional mix maps and masks to add puddles. My scene is lit with one dominant directional light, a skylight to give a nice Green/Blue ambient light in contraposition of the temple warm light, plus an HDR map. One benefit of this is being flexible to constantly change the lighting angle and the time-of-day. After I putted on the background the fog to emphasized the sense of depth. Inside the Temple to achieve the mystical lighting I used the Yellow god rays Lighting, I started from a cone shaped modeled in Max and then I assigned the god ray-material into Unreal. Inside Unreal 4 Modular Environments course, I had the opportunity to realized a fully realized environment for my portfolio screenshots. I’d like to thank Clinton Crumpler for the help and his feedbacks. In this last year I have also completed two other courses from CGMA, which are Intro to Environment Art with Andres Rodriguez and Texturing and Shading for Games with Kurt Kupser. From these courses I learned the foundation about the environment pipeline to create high quality assets, and how to create materials and textures for video games in Unreal Engine 4. Soon I will post the result of my work on my Artstation profile. Hi, my name is Zach Bush and I currently live in Southwest Virginia, USA. In 2008, I received my B.F.A. in graphic design at Radford University. Upon graduating, I worked for the government for about 6 years which I quickly realized was not for me but I needed to pay off school loans so I stuck it out. I decided to change things up and went back to school to get my masters in 3d environmental design from Virginia Tech. After that, I still felt that I needed to learn a better pipeline for how to create environments for games so I signed up for the CGMA class UE4 Modular Environments taught by Clinton Crumpler. This class was exactly what I needed and was a great learning experience for me. I feel much more confident and well equipped with the tools and knowledge for creating game environments. I am now currently searching for a full time job as an environment artist. The main goals were to learn how to create modular pieces as well as unique and tileable textures for my environment. I didn’t want the space to feel empty when the project was complete but rather to feel like it had been lived in. After working on this project for about a week, I decided that it was time to switch over from using Cinema 4d to Maya since Maya is one of the industry standard programs for creating games. It didn’t take long to get used to the layout since I had used it before but not consistently. Most 3d packages contain the same tools, so my main challenge was just figuring out where the tools were located. Before opening up Maya or Unreal, I needed to come up with my concept. I decided to create a fictional space called a Light Lab. Here’s my backstory: In this post-apocalyptic, overly polluted world, natural sunlight has become scarce, and artificial light is becoming a commodity. In an effort to garner control, the corrupted government officials have outlawed light farms and require citizens to obtain their light from them, at huge markups of course. The Light Lab is a hidden light farm, creating synthetic sunlight outside of the government’s watchful eye. Engineers and scientist have gone underground to fight the suppression. Right now they’re only focusing on creating a functioning machine and getting the captured sunlight to people who desperately need it. The work is dangerous and hurried, but someone’s gotta do it. My main reference was the office my wife and I share in our house. The format of this room was the room I wanted to create. I took a few pictures of it and quickly laid out where I wanted things to be located. I created a Pinterest board for much of my inspiration and reference images of what I wanted the style of the room to look like and all the props I wanted to incorporate. This way it could all be in one place that I could quickly access while working. Before switching over to Maya, I blocked out the modular pieces that made up the room in Cinema 4d. Then I looked through my reference imagery and blocked out a lot of my larger props: desks, chairs, file cabinets, tvs, etc., that I knew were going to be in the room. The class as a whole was 10 weeks long and each week we had milestones to hit so we wouldn’t fall behind. After the block out, I worked in Maya and got started on developing the props by adding more detail to each one. I would place each model into Unreal once I had created it to help me figure out if and when I needed to create more pieces to help fill up the room. I baked my maps in Mightybake. For a lot of the props I created I used Quixel’s DDO and NDO for my texturing. There were a lot of different props so I couldn’t go into a ton of detailing with each one but wanted to have enough to make the entire room work as a whole together. For the sake of time, I took a seamless texture, from textures.com, of some seamless wood planks and created a normal and ambient occlusion map out of it. Then I placed all of these maps into Unreal to create the texture for my floors. The cracked plaster on the walls came from taking a masked texture of damaged plaster and I created a decal material in Unreal. That way I could place it anywhere on the walls I felt was necessary. I did this same technique for some of the trash on the floor and the stains in the ceiling tiles. I kept the lighting pretty simple. I started out with a couple of point lights for the glowing energy ball, a spotlight for the one fluorescent light that still works, an Exponential Height Fog, and worked my way out from there. I only used a Sky Light and a few more smaller spotlights for the screens. What really allowed me to set up the mood I was going for was using LUTs (Look Up Tables). I had never used them before but during one of the lessons, Clinton showed us how to create them using Photoshop and placing them into the Post Process Volume in Unreal. This was a game-changer for me, it really helped speed things up and quickly gave an overall look and feel for what the lighting needed to be without having to individually tweak each light. Clinton showed us a great way of how to plan everything out before jumping into the project which was very helpful because he went into detail about ways to go about it so you wouldn’t fall behind when working with a deadline. Also, learning how to correctly create modular pieces using the grid was something I always wanted to learned but never knew if I was doing it right or not. Clinton did a great job of teaching us how to use many different types of materials in Unreal which was a huge help in making changes to my textures without having to leave Unreal to do so. The best thing I would say I learned was getting clarity of whether I was had been doing something right, wrong, somewhere in between when creating environments. Getting feedback from a professional in the field was invaluable and I am very grateful to have taken the class. I would definitely recommend this class to anyone interested in learning industry standard practices. Hi, my name is Adam Idris, I’m a freelance 3D artist and game art lecturer from Brisbane, Australia. I’m currently working on a VR dancing game titled Dance Collider at a studio named Emerge Worlds. In my spare time, I’m constantly working on small personal projects and recently have begun delving into game dev as I feel it would be rewarding to be able to explore, bring life and interaction to the environments I’ve created. I should begin by stating that establishing a brief before jumping into any project I work on. It helps prevent scope creep and not become bogged down on arbitrary details. I’m very passionate about sci-fi and cyberpunk visuals and because of that tend to lean towards creating scenes or models from that universe. Previously I had made stylized ancient ruins and an alien environment. I decided that this time I wanted to challenge myself in creating a dieselpunk inspired environment. Part of the challenge was to emphasize mood and convey the story through visuals in a cinematic way. With that in mind, I needed to source for references. Notable references were Guillermo Del Toro’s Shape of Water, Bioshock, and the industrial revolution. In this phase, I took note of vintage architecture right down to lighting, fixtures, fittings, and surfaces that would be part of the environment. To create a more cohesive and plausible environment, I tried to deconstruct what materials were used for walls, pipes, and windows during the 50s. Before building modular parts for my environment it was important to establish a scale. The approach for this was to introduce an average scaled mannequin model and setup Maya’s units to match UE4. 1 UE4 unit = 1 meter. From here I have a grid that I built on and started to block in the major masses such as the walls, ceiling, and floors. By implementing the grid and a strict unit guideline I could ensure my assets would snap together as needed and always be on the grid. If I needed smaller incremental changes I would divide my grid by halves, quarters and eighths. Just like painting, establishing the broad strokes gets you a sense of scale earlier on. Next was populating the scene with secondary and tertiary details. I spent most of my time in Maya and used a mass FBX exporter to get blocked in parts into the scene. This little script saved me a lot of time on the iterative process and automated the exporting process. After becoming aware of the production methodologies used on Star Citizen and Alien Isolation, I became interested in medium poly models and implementing face weighted normals into my asset workflow. This Reddit post was a handy overview. For larger scaled assets such as the cryo chambers and bubble chambers, I added in extra subdivisions to account for the geometry appearing blocky and then applied Bnormal script to it. 1 to 2 bevels was sufficient to make a difference in the edges of my meshes. Here is the Bnormal script that was used for face weighted normals. With most of my geometry being either low poly or medium poly with face weighted normals, I was able to skip the high to low poly process altogether to focus on texturing. Because I’m primarily a generalist, I found most of what I needed to work within Substance Painter. Any decals I needed normals generated for were done in Quixel Suite’s NDO. To produce sharp normals for my trim sheet I opted to use Marmoset Toolbag. These normals were later thrown into Substance Painter to generate my materials. To ensure that my textures for my trim sheet were given enough texel density, I set my trim sheet up to 2k bearing in mind that would be 4m thus dividing the geometry up to scale with assets in my scene. A peer, Dave, mentioned that he put his trim sheet next to his mannequin to better gauge scale comparison. I needed to have a cryo chamber that was destroyed. The purpose of this was to create tension, suspense, mystery and to encourage the viewer to questions like “What was in this chamber? Where has it gone? Is it hostile?”. Not being particularly satisfied with the outcome in Maya’s Create Shatter a peer of mine recalled that UE4 had a mesh destruction simulation. I was able to quickly do this with UE4’s destructible mesh and a simple blueprint that ‘woke’ up the rigid body solver upon playing or simulating the scene. Still being relatively new to blueprints, I will admit, I stumbled my way through this part. Films are notably the best point of reference for dramatic lighting. Early in my project, I knew that I wanted to invoke a mysterious but not horrific environment with a dense atmosphere. To fake light bulbs, emissives became very handy for making convincing lights. With necessary key project management methods employed earlier on, it was important to be able to manage the project as efficiently as possible. It was important to note that instances based on master materials updated quickly which allowed for rapid iteration. Water is always a tricky one to execute properly. I arrived at a solution whereby I plugged a ‘simple grass wind’ node into the world position offset of the material. This was only applied only the meshes that were inside the cryo chamber. During the post-processing, I focused primarily on accentuating a contrast between warm (yellow) and cool colors (green and blue) and paid particularly close attention to how it was affecting the mood. When in doubt, I regularly referred back my images. Mateusz Kozłowski created an interior of the 80s-90s room that perfectly tells a story about a boy who had big dreams and once left the house to make them come true. First thing in making modular environments is to make modular meshes. Here are the modular floors and walls I made. Everything is based on the grid so they will snap one to another in the engine. After I was satisfied with the blockout I began modeling high poly and baking them into low poly after unwrapping UVs. For the modular meshes, I tried to use texture trim to avoid a great number of unique textures. Here is a simple example, I decided to add a rough comment for myself to not get lost in what is what. I made two Master Materials, one for assets and one for tiling meshes. From them, I made material instances. Master materials are great, they give extra flexibility on instances, so I definitely recommend to use them. Here is a quick example of the tiling material. Static switch parameter is also a nice thing to have in it. Hi, my name is Owen Kiayias, I am from Wollongong, Australia. I’m a graduate with an advanced diploma in Game Art and currently working on my environment art portfolio for employment. One of the main aims of the project was to make a modern-day interior scene where I could visually tell a story of a recent event and gain a better understanding of lighting within UE4. I initially wanted to create a bank robbery scene, but then decided to choose a jewelry store. A lot of the inspiration came from the game PAYDAY, reference sources for design mainly came from Artco Group portfolio which is a store planner and designer company. They designed a variety of jewelry stores, and I gained good ideas for my own design. Firstly I started with a basic block-out in Maya with the major structural shapes of the scene. As the final output was in UE4 and it was a realistic environment, I worked in centimeters and built the block-out according to the real-world scale, rounding off all assets to the nearest 5 cm, and then separating the structural meshes into modular pieces and making sure they would snap together on the grid. Door manufacturing and display fixture websites, as well as Google images, helped to study real-world dimensions. After creating the block-out in Maya I then thought about the asset approach: whether I would use a tileable/trim sheet or make a unique asset. I exported the block-out meshes into UE4 to get a feeling of the space in the engine. Trello helped me a lot with the asset management. Everything I planned for the scene was broken down into modular and unique meshes, textures, materials, props, decals, design reference, a mood of the scene, etc. It was all listed in Trello, along with reference images of each asset for its visual look. I worked on the structural aspects of the jewelry store first and started with those elements that had a dramatic impact such as walls, floors, ceilings, display fixtures, wall fixtures, ceiling lights, doors. Most of these assets are modular and were modeled in Maya. They had tileable textures or trim sheets which were then textured in Substance Painter or created entirely in Substance Designer. At this stage, I was also working out what texel density I was going to use so that all future assets are felt as parts of the same world, and not out of place. Working on these large assets helped me to tackle any scaling and design issues early on. Next, I worked on the smaller assets such as props such as the furniture, picture frames, cash registers, exit signs, and jewelry. These assets were all modeled and then textured in Substance Painter/Photoshop. Amazon helped a lot with the dimension references. After creating the general space of the jewelry store I then moved to the story-telling aspect of the scene. I ended up drawing a quick top-down flow map to organize the series of the events that took place in the store to express the story of a robbery. I created such assets as broken displays, heist equipment, footprint decals, and dropped cash. I also went back readjusting certain assets that were already in the scene such as the busts and mirrors and tipped over stools. After completing the interior I moved on to creating an exterior to make the scene a part of the world instead of an empty void. When creating the textures for PBR, I ran into some problems with the wood textures on the display meshes, as the albedo was too dark and couldn’t be read in the engine properly. So I went back and adjusted the albedo to be lighter. Roughness plays a key role in defining readability of the environment and what the material is. Roughness variation in assets will bring believability to the scene. You can visualize your scene’s roughness in the buffer visualization. A lot of the textures used RMA texture packing, which made it easier to manage the scene in the engine and also allowed me to use less texture memory with one import, compared to using three. I packed textures either in Photoshop or in Substance Painter using RMA preset. I mostly created master materials with different parameters and then transferred them into Material Instances. It made the scene perform smoother and allowed me to adjust parameter groups on the spot such as tinting over the base color and readjusting the roughness values to avoid going back and re-authoring certain textures. The master materials consisted of a unique, tileable, and decal materials and one for foliage. Read more about the master material production here. Working with the glass material I kept it very simple at the start and came back to it later. Based on the scene lighting and the meshes that included glass material (broken or not) I ended up using vertex color information where I could paint in certain aspects such as the glass cracks, the frosted edges and dusty/dirty stained glass. Each display fixture glass mesh that was damaged had its own unique mask and normal information maps, and I used vertex paint on them to get control of the appearance. One of the problems I encountered was the readability of the cracks. I was not able to get the result until I ended up adding the masks to the emissive output and a small value to give it more pop, so it could be read from a distance. Lighting is always a challenge for me and it varies from scene to scene. I wanted to convey a natural sunset lighting outside with a bright natural lighting inside typical for a jewelry store with a lot of reflective elements. The lights were broken down into the following groups to ease the balancing and management based on their location within the scene. Ceiling panel Lights (green). Lights along the ceiling panels were all static spotlights with the same values for each. They have mainly placed over the display fixtures and along the walls. Main Lights (red). These were the lights behind the actual counters and the storage area. They were set as static spotlights, but at larger angles with a higher intensity and softer fall-off with shadow casting. Lights with a very low intensity were also placed just below main ones to give a little glow and bounce back onto the ceiling with no shadow casting. Display Fixture Lights (pink)/Center Display lights (yellow). The main display fixture lights were static and only covered the area of each display, accompanied by another point light filling in the center of the displays with a low intensity and no shadow casting. Side Display Lights (turquoise). I used static spotlights for these areas and with a very low intensity and soft fall-off. Chandelier (blue). The Chandelier consisted of 1 stationary spotlight just below it with an angle to what I wanted it to influence and 4 point lights above each globe to get shadows of the chandelier casting back onto the ceiling. During the process, I also added about 6 spotlights facing directly to the ceiling throughout the interior to gain more lighting information as it was too dark. As with lighting, post process in UE4 can transform a scene from nice to stunning and let you achieve a look you were going for. Lookup table is an awesome feature that can help with this. I took a screenshot of the scene in UE4 after lighting was baked then moved it into Photoshop and made adjustments such as levels, exposure, highlights, midtones, and shadows. Then I brought the adjusted image back into UE4 as a lookup table and got the look of the scene I wanted to achieve. Creating an environment takes time, that’s why start the projects that are manageable and do not go overboard. Spend as much time planning as possible before diving in as it will save time in the long run during the project. Collect feedback: the places like Polycount or Jeremy Estrellado (Dinusty) discord are great places for this goal. Finally, make things that inspire you as it will motivate you no matter what the project is. I personally want to say a big thanks to Clinton Crumpler for his feedback during the project. Pedro C. Prieto showed how he worked on the amazing UE4-environment inspired by Helder Pinto‘s Arbor Vitae. Hello, my name is Pedro C. Prieto and I am an extremely passionate artist who is always striving to produce the highest quality work. I was born in Lima Peru but moved to California at the of on 11. I went to the Academy of Art University in San Francisco, and have lately been taking classes online with CG Masters Academy. I live in San Francisco, and I am actively looking for an opportunity to work as an environment artist in the gaming industry. When creating an environment, my main focus includes lighting, composition, color values, and storytelling. Storytelling is the most important piece when creating immersive worlds for the player to get lost in, and I am a strong believer that environment art and design play a huge role in the narrative of the game. Ever since I saw Helder Pinto show off Arbor Vitae in a presentation with Gnomon back in 2016, I’d been wanting to recreate my own Arbor Vitae-like version. Its vibrant colors, beautiful lighting, intricate sci-fi designs, and most importantly the narrative behind its creation, made me fall in love with the scene, and it’s what inspired me to attempt creating an environment of that caliber. However, I knew the time to take on this type of project was not right for me, since I was still learning about the use of multiple tools (Substance, UE4, Maya, etc). So, I waited and kept polishing my skills when working on different personal projects. My first step was to set up my grid in Maya. I made sure that everything would snap to each other, and would follow grid measurements. I knew this was going to be a big project, so re-usability was one of my main pillars. My Maya file was set up to centimeters, and I used this guy as a human height reference. He is about 180 centimeters, so my main blockout piece master guide would be 200 centimeters by 200 centimeters. Then I made sure Maya UV editor would also follow my grid guideline, by defining a 20×20 X and Y length. Then I made different blockout variation pieces, a 200×100 piece, 100×100, 400×400, and some corner pieces. I was technically building a lego set that I would later assemble in UE4. Once I had imported all my blockout piece into UE4, I started creating the space of my scene. I tried to avoid making my scene feel “blocky” by making it as interesting as I could with these simple pieces. As I started building my blockout, I realized that if I needed new pieces, I would go back to Maya to create them immediately. I ended up with 9 pieces by the end of my blockout phase. Since all my pieces snaped to each other and followed the “grid”, it was quite simple to get creative and come up with different layout variations. However, for my taste, this layout was complete and ready to go. Later on, when I started importing my final walls, floors, and ceiling pieces, I would just quickly swap my blockout pieces, since all of them respected the grid measurements. Right from the get-go, I knew that I wanted to integrate a hero piece into my scene. So, during my blockout phase, I made sure to leave some space for this unique piece. I wanted this project to be all about speed, so I made a trim sheet dedicated to the hero prop only. I quickly made some rough drafts to eliminate the bad ideas. Unfortunately, I can’t show those models anymore, because I no longer have them. I didn’t want to completely rip off Helder Pinto’s hero piece, so I decided that the bottom piece would be a completely different shape than Arbor Vitae’s. Once I was happy with the basic shape, I took it a step further by adding bevels on the edges, and some additional details on the mesh itself. Lastly, I finalized the hero trim sheet and tested it in Maya before importing it into UE4. Once I had my walls, floors, and ceiling placed with the Normal and AO maps, I moved into adding color. Since the very beginning of the project, I chose my color palette and stuck to it, with orange as my accent color, and black, white, and silver as supporting colors. I baked my Normal, ID masks, and AO maps using MightyBake, and used substance painter for the rest of the maps (color, roughness, metalness, and emissive). For sci-fi environments, I figured emissive lights play an important role, having them flicker, fade in and out, and on and off. So, I made sure to have a few extra parameters and switches that would handle my emissive maps in my master material. Here is a picture of my master material, I added a few parameter nodes for value tweaking, especially for my emissive maps, but overall it’s pretty simple. I made one master material in UE4, and all materials with the exception of a few (water, terrain, fog, decals, etc.) inherit from this master mat. I also made a Decal master Mat. Decals were essential for breaking up the modularity repetition and adding sci-fi signs or such. My main texturing software was the Substance suite. However, I did use some Quixel’s NDO for map conversion on assets that were at a distance from my main focus like the terrain and tree textures. I grabbed these textures from texture.com and converted them using NDO. For the rest of my assets, I used Substance Painter. I created a smart material for each color (orange, white, black, and metal/silver) that would save material values such as color values, rough values, and metal mask. So each time I brought in a new mesh, I would just place the smart material in the corresponding ID color. This technique saved me a lot of time since I was going to paint a lot of meshes for my scene. The key assets for my scene were definitely my trims and my hero prop. Since the trims were going to be scattered throughout the map, they needed to be high quality. Therefore, I spent extra time polishing them. I made sure I came up with interesting sci-fi shapes for my trim sheet, this was a process that took me quite a few iterations. I ended up with two trim sheets, a horizontal and vertical one. For the hero prop, I made sure that I polished it and made it look as interesting as much as I could since it was going to be the centerpiece and the only unique piece of its kind. It took me 4 tries to come up with the final design, and a total of 2 weeks to have it up and running in UE4. Then my goal was to keep a uniform theme throughout my assets, from the color palette to vision of my scene. I made sure that all my assets felt like they belonged in the same environment, by using the same level of quality and stylization. And last, but definitely not least, I finished up my lighting. I didn’t touch the lighting until all my assets were placed in the right location with their corresponding textures and materials. I wanted the main room where the hero prop is located to have a warm feeling and a blue-ish tone for the dark areas. I made sure the sunlight was hitting the hero prop to make it stand out. I added artificial lights on some walls, back door, and other assets to make them pop as well, but leaving the backside darker with a blue-tone was key in making the main room stand out. Lastly, I added a little bit of fog on my lights by using the new volumetric fog feature UE4 now provides for a more filmic look. Emissive lights also played an important role during this process, making sure they were evenly distributed, with their proper tones and values. The project took me around 6 months to complete, it was my first time attempting to create a true game environment where the player could walk around and feel immersed (at least I hope so!). The hardest part was coming up with interesting sci-fi shapes for my normal baking. It was a process that took me several iterations to make it feel like a terraforming machine on the planet. Once I got my shapes ready, everything else developed organically. Eugen Čanić talked about his atmospheric Gothic Library made in UE4 within CGMA course UE4 Modular Environments led by Clinton Crumpler. Hi, my name is Eugen Čanić, I am a 3D artist from Croatia. I studied architecture in Zagreb, Croatia and I’ve chosen to specialize in Environment art and Level design for video games. During my college years, I started learning 3D modeling aimed at architecture with software like Sketchup, Rhino, Revit. Only after my 3rd year of college did I discover the wonderful world of programs that make game production a reality. I started experimenting and working in 3ds Max, Maya, Substance Suite, ZBrush and so on… and could not stop myself. I decided I wanted to pursue a career in game development. Since then I worked with a few local indie teams on several games and worked at various studios as a 3D modeler. The project for CGMA class was just a stepping stone for my portfolio with which I aim to enter the games industry. A friend of mine recommended CGMA classes to me last year during the IFCC festival in Zagreb. I have been doing Props and Environment Assets in 3D for some time now and wanted to take my art to the next level. I knew I wanted to specialize in Environment art and Level design so when I found the UE4 Modular Environments class by Clinton Crumpler I thought it to be the best option. Before that, I had just been starting to use the incredible Unreal Engine 4 and thought this course could also help me improve my UE4 knowledge and skills. But most importantly I wanted to make a game ready scene that could be used in a game level and go through all of the production phases needed to achieve such a goal. With this project, I wanted to create a coherent environment that is intriguing and mystical but also explorable and could be fun to play. At the time I was playing Bloodborne feverishly on PS4. It is a really inspiring and meticulously crafted game. The environment art and levels are beyond exceptional. I have always had a thing for libraries, so naturally, the Cainhurst area really stuck with me, especially its grandiose library. I knew I wanted to do something with the elements of gothic, medieval, and fantasy. We had a defined time frame in which the scene should be produced so I opted for a smaller scene which could be completed in a few months. I started by collecting images and references for the project, looking for anything ranging from gothic and medieval architecture to video games with fantasy and medieval atmosphere and design. I stumbled upon a small medieval library in Manchester – the Chetham’s library – which seemed perfect for the job. It has been preserved almost intact since the time it was built and had a dark and gloomy gothic vibe about it. Further research led me to a lot of other pieces of English Gothic architecture which I later used for some of the details in the scene. I used the Manchester library as the basis of the scene layout but added some elements and details from other examples I found, like the Gloucester cloister and the Oxford college hallways. I started making a blockout with some basic meshes just to get a feel for space. After a few iterations, I was satisfied with the layout and the scene I would be working on. The final layout was a combination of the real Manchester library with the addition of some custom spaces from various inspirations. One of the first tasks I had concerning the library was breaking down the interior into sizeable modules. I went through all the images of the Manchester library I could find on the internet, also using archive footage and several documentaries online to see a video walk through the interior. Video footage helps even better to see and feel the chunks, nooks, and crannies of an architectural space that you just can not see in one image. I listed and defined all of the possible modules, their respective materials, and details. This whole process was backed up with paying attention to gothic architecture references. Besides the modules that come directly from the Manchester library, I also used some pieces from other examples of English Gothic architecture, using vaults, corners and some window details from other period pieces. This was the first time for me, making gothic architecture and ornaments for detailed models. I started by collecting a lot of old architectural illustrations depicting gothic details and even construction references. This way I was able to mimic the process it would take to make the arches and vaults in real life. Using the same mathematical principles and going through the same steps you would take to make them in physical form I achieved it in the digital medium. The key feature of all the modules was to make them reusable in different situations, being able to rehash them in any way and still get a decent gothic library level. The meshes and asset packs were determined by the aforementioned reference list. The assets were divided into several groups: modular assets, unique assets, and hybrid assets. The modular assets had shared textures and were generally lighter on the poly count. The unique assets were all of the little details like the books, candles, chairs and so on that had a separate texture set and a very simple material setup. The hybrid assets are something in between the two previous types, having joined textures but being more polygon heavy. Those were mostly the trim sheets used around the environment. Most time was put into unique assets simply because they required most of the technical work – making a low-poly, then a high-poly asset, combining them in baked textures and placing them in the engine. Biggest challenges surrounding the import of said assets were preparing them beforehand. Making sure the UVs were correct and not overlapping, the lightmaps that the Unreal engine creates were OK, and that the mesh hasn’t got too many polygons. Since the planning phase, I wanted to make the books procedurally. Not only would it make the book placement more interesting and organical, but it gave me a chance to learn more about the Unreal’s Blueprints. For inspiration, I looked at various UE4 projects that did the same thing with books and similar props. In the end, I was most influenced by Aiko Shinohara’s Oxford Library project in UE4 which was also a stylistic inspiration from the beginning. The books are actually randomized from one single mesh that had 2 to 3 texture variations mapped in the material editor. It was essential to get the size, the tilt, the color variation and the length of the book row defined by the single blueprint. This way I could place a stack of books anywhere in the scene and then adjust them to the needed situation. The result was getting a randomized row of books for the various shelves in the library but it also gave me a possibility to place them freely around the place – giving way to a more organic scene which could feel as if it was used by the old librarians. Lighting in the scene went through a lot of iterations. I knew from the start that I wanted the place to be dark and gloomy but to also have highlights of candlelight that catch the viewers attention. First came a light blue directional light which was to mimic the moonlight. The interior was made very dark from the start with individual point light being added gradually to liven up the scene. The point lights are combined with several light meshes. The individual candles, candelabra and wall lights all got a light source of its own in their own separate blueprints. This time I used blueprints to have more control over the whole scene, changing simultaneously the properties of light in all of the linked assets. The light assets were then scattered around the scene to not only highlight the architecture but also to get a sense of place being used. The candles were completely made in polygons, with the fire being animated and textured through the material editor. The flame flickering was achieved using the vertex world displacement with mathematical nodes in the editor like a sine wave and the panner. To finish things up, volumetric fog and dust particles were added to give the place the feel of an old dusty library. This course has been a great experience for me. Not only did I get a chance to learn from the industry professional like Clinton Crumpler, but also to communicate with other artists during the course, get their feedback and share experiences and knowledge. I am glad I participated because of all the new stuff I learned concerning the level and environment production through all of the phases – from start to finish. I am proud to start my portfolio with this piece and hope to make it one of many in the upcoming years. The scene Goodbye, Soldier is inspired by a short comic story called War III written by Ricardo Barreiro and Juan Giménez‘s art. When I first read it, I was 11 years old. The story tells us about a group of 6 soldiers patrolling the streets of ruined Paris after the blast of several neutron bombs. The city should be empty but suddenly they are under attack of a sniper who never fails. Since then I wanted to make a short film with it but, to be honest, it’s too much work for one guy. So I decided to create only a part of it in UE4 to practice and improve my skills in lighting, composition inside the engine, and texturing with Substance Designer.